For the 1970 film also known as The Losers, see Nam's Angels. 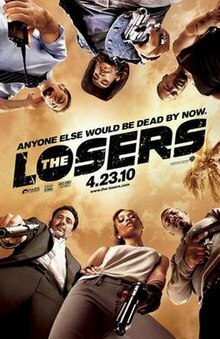 The Losers is a 2010 American action film based on the adaptation of the Vertigo comic book series of the same name by Andy Diggle and Jock. Directed by Sylvain White, the film features an ensemble cast that includes Idris Elba, Chris Evans, Zoe Saldana and Jeffrey Dean Morgan. Four months later, Clay is approached by Aisha (Zoe Saldana), a mysterious woman who offers him the chance to kill Max, against whom she wants revenge. Clay accepts and Aisha arranges for the Losers to return to the United States, where they proceed to attack a convoy supposedly carrying Max, only to discover that they were tricked by Aisha into stealing a hard drive with Max's secrets. Unable to access the files, Jensen infiltrates the company that made the drive and steals an algorithm that allows him to crack the code, discovering that the drive contains credits for a $400 million transfer in Max's name, which he received for selling "Snukes"—eco-friendly bombs with the potency of a nuclear warhead, but no fall-out—to international terrorists. Tracing the money flow to the Los Angeles International Port Of Entry, which the Losers deduce is Max's base, a plan is formed to attack it and kill Max. While studying the drive, Jensen discovers that their mission in Bolivia was a cover so Max could eliminate the drug lord—who had discovered his plan—and that Aisha is the man's daughter, seeking revenge for his death. After her cover is blown, Aisha shoots Jensen and escapes. Believing that she might betray them, the Losers decide to speed up their attack on Max's base, only to be betrayed by Roque and captured by Max and his right-hand man and chief of security, Wade (Holt McCallany). As the Losers are lined up to be executed, Aisha returns and ambushes Max's team. In the ensuing fight, Clay confirms that he killed Aisha's father. Roque attempts to steal Max's plane, loaded with his money, and tries to escape. As Roque's jet heads down the runway, Wade takes a motorcycle and goes after him to retrieve Max's money. Cougar shoots the motorcycle's engine, causing Wade to be hurled into the jet's engine and the flaming motorcycle to be hurled into the cockpit of the plane, which explodes, killing Roque. As Jensen, Cougar and Aisha help Pooch, who has been shot in both legs by one of Max's security guards, Clay pursues Max to a crane, where Max says that he has activated a Snuke that will destroy Los Angeles, and Clay will have to choose between de-activating it or killing Max. Clay chooses the former and Max escapes, but Clay affirms that he now knows what Max looks like and will soon find him. Max escapes on a bus and is robbed by two thugs. His fate after this is unknown. Shortly thereafter, the Losers help Pooch reach the hospital where his pregnant wife is giving birth to their son and attend Jensen's 8-year-old niece's soccer game. Jeffrey Dean Morgan as Colonel Franklin Clay: Clay is a special forces colonel and the defacto leader of the group. Morgan, who starred in the superhero mystery film Watchmen (2009), felt that playing Clay was far less complicated in comparison to his Watchmen role as Comedian. Because of the radically different approach, Morgan stated that it gave him more freedom and allowed him to be more playful with his character. "This guy has a real, actually much better sense of humor than the Comedian did," avouched Morgan. "He’s not nihilistic. It’s completely different. This is much lighter. A much lighter load for me. There's also kind of room for me to interpret this as a project where, in Watchmen, you had to– look, I was playing the Comedian in the most revered comic book ever written. I was confined to that. In this, I could fine-tune a lot of what I thought Frank Clay is and get to play with it a lot more." Jeffrey Dean Morgan took the role of leader very seriously and was on set every day, even if he was not in the scene. Idris Elba as Captain Louis Roque: An expert in detonating and deactivating explosives. Elba previously worked with Joel Silver in multiple films, and opined that his ties with Silver helped him sustain a role in the film. "Sylvain White, the director, is someone I've known in the industry, and he said to me 'I've got this thing I'm working on'. And a few directors had looked at the script, and were going to make it, but Sylvain landed it." Zoe Saldana as Aisha al-Fadhil: A native Bolivian woman offers assistance in locating Max. In preparation for the role, Saldana participated in extensive weapons and physical training. The actress was required to gain a couple of pounds, as she was expected to carry weapons around for eight hours a day. Saldana summated al-Fadhill as a manipulative and mysterious individual. "She’s a snake. You don’t really know what she’s hiding up her sleeve. She definitely had her own prerogative and it’s very meaningful for her. She’s trying her best to play her cards right, but Jeffrey’s character just gets to her. There’s just something about him that she’s unable to kind of to fill her task, her mission." 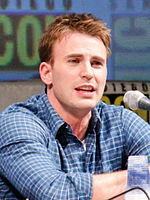 Chris Evans as William Jensen: The team's intelligence specialist and computer hacker. Evans professed that portraying the character was considerably different from his previous roles. "He's just a fun guy, you know? He's kind of the comic relief," Evans stated. "He loves life. He's a little nerdy. He's not very smooth." The actor further evaluated Jensen's personality: "He's not only a fun character because of the energy you get to infuse it with, but who he is, it's kind of against type. I don't really get to play guys who are awkward and uncomfortable at times in certain situations, so it's fun to play him." Tim Story was initially announced as the film's director in 2007. The Losers was thought to be a notable departure from Story's previous work, as he spent considerable time directing the American superhero films Fantastic Four (2005) and Fantastic Four: Rise of the Silver Surfer (2007). An ardent fan of the war film genre, Story sought influences from the war drama Black Hawk Down (2001) and the television miniseries Band of Brothers (2001). "I was looking for a vehicle that would have that edge," he affirmed, "but I didn't want to lose my personality, which is a bit tongue-in-cheek, where the characters have a little fun with each other." Coinciding with Story's arrival, Peter Berg was declared as a producer for The Losers. Berg was originally responsible for conceiving the film's script—ultimately having intentions to direct the film—but later concluded his endeavors in lieu of creating Hancock (2008). Alongside Akiva Goldsman and Kerry Foster, Berg collaborated with longtime partners Sarah Aubrey and John Cameron. Sylvain White replaced Story as director in October 2008. Prior to the revelation, White was developing an adaptation of Ronin. A native of Paris France, White asserted that his fascination of The Losers became evident after drawing parallels to the graphic novels he read as a child. "What appealed to me about The Losers was that it wasn't the typical superhero-with-superpowers thing. It was based on real characters—realistic characters—and based in reality, like a lot of the European graphic novels that I had grown up reading." Jock and Andy Diggle, the creators of the Vertigo comics of the same name, worked closely with White creating for The Losers; the former in particular was sought after by White for help. "From the beginning, even when I was working on the screenplay, I had a really tight dialogue with them — even in trying to visualize some of the scenes. I would talk to Jock often, because he's obviously got an amazing eye, and they came down during production. I'm actually talking to them almost every day right now, talking to Jock in terms of design. We included some of his design work into the design of the movie. I'm not going to give it away, but it's certain little design elements that we use to introduce the characters or transition from one location to the next." The film adapts the first two volumes of the comic book, "Ante Up" and "Double Down" and tells the story in a more linear way than in the comic books. Elements of the story have been left out instead of trying to squeeze the whole story into one film and the director would like to tell the rest of the story if the film does well at the box office. 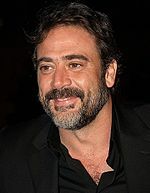 In February 2009, it was reported that Jeffrey Dean Morgan would headline the upcoming adaptation playing Clay. In March 2009, it was confirmed that Columbus Short will play Pooch, Idris Elba will play Roque and Zoe Saldana will play Aisha, Chris Evans playing Jensen, and Óscar Jaenada playing Cougar. In August 2009, it was announced that Jason Patric will play Max. The release date for The Losers was changed on two occasions; it was originally delayed to June 2010—as it roughly coincided with the release of Clash of the Titans (2010)—ultimately reverting to an April release. This occurrence was partially attributed to investment purposes as well as to accommodate reshoots for the film—although reshoots were not needed for the film. "So I think the marketing department decided, 'Let's maybe move to the June date,' but then the April date opened up again and they went back to it. I'm not quite sure how the science of these things work, that's not really my department and I trust the marketing at Warner Bros. to make the best decision for the movie." Principal photography commenced over a period of four months from July to October 2009. Despite the diverse array of settings featured in the film—which included cities such as Miami, Dubai, Mumbai, and Los Angeles—most of principal photography transpired in Puerto Rico. White found its infrastructure and locales to be ideal and convenient, giving them the ability to "cheat" because they had "a variety of terrains within a relatively small distance". "It was staggering what we found when we came to Puerto Rico to scout," recalled Foster. "There is a city, obviously gorgeous beaches, a close approximation of a desert, and a rainforest that was ideal to double for Bolivia." Filming locations in the area include the Arecibo Observatory, which /Film's Peter Scrietta felt that producers used the tropical environment to their advantage. Color was strongly emphasized in crafting the visuals of the film. Production designer Aaron Osbourne attempted to enhance the color scheme of the comics, which he noticed that only two to three colors were used to convey the tone of each setting. "Every chapter of the comic books is a new environment distinguished by different color palettes," explained White. "I really wanted to do that in the movie as well–where every time we are in a new city or country, the aesthetic of the film changes completely, so there is no homogeneous look. It’s very eclectic." This meticulous approach was echoed by cinematographer Scott Kevan, who White collaborated with in breaking down the images of various scenes. "We charted the whole movie with certain color schemes for each location and different shades as we moved from day to night." Promotional artwork for the film was released at Comic Con, the poster was drawn in the style of the comic book by series artist Jock, and was later recreated photographically with the cast from the film and used as the theatrical release poster. A four-minute preview of the film was shown at WonderCon. A special "double volume" collected edition graphic novel was released to tie in with the film adaptation collecting including the volumes Ante Up and Double Down. A second book to collect the rest of the series was also released. In June 2009, Warner Bros. set a tentative release date of April 9, 2010 for the film. The release date was then pushed back to June 4, 2010, to avoid going up against Clash of the Titans also from Warner Bros. The trailer for the film was released online January 29, 2010, and was shown in theaters with Edge of Darkness. An official photo for the film was released online. The release date was subsequently moved up to April 23, 2010. The film received mixed reviews. Rotten Tomatoes gives the film an approval rating of 48% based on 164 reviews, with the site's consensus stating "The Losers is loud, fast, and unrelentingly violent -- but it's also funny and well-acted, which will make all the difference for some action fans." Review aggregation website Metacritic assigned the film a weighted average score of 44/100 based on 32 reviews from selected critics. Peter Debruge of Variety criticized the film as "the sort of pyro-heavy exercise parodied in Tropic Thunder". He noted that casting against type helps make the team more memorable but complained that despite the polished production, the film offers only a hollow "junk-food high." John Anderson described the film as a good idea pushed to excess, and with all "the freshness of last week's salad bar." Scott Tobias of The A.V. Club complained about the lack of "humility or self-deprecation" in the heroes despite their title. He noted how the film tries so strenuously to be cool and described the film as nothing more than "style for its own sake". Kyle Smith of the New York Post lambasted the film, giving it half a star out of 4. He described Zoe Saldana as a "femme banale", saying actors Jeffrey Dean Morgan and Idris Elba deserved better. He described the film as one that "tries to do so little, and yet falls so short." Phelim O'Neill of The Guardian gave the film 3 stars out of 5. He noted similarities to The A-Team and criticized the film for being full of action movie cliches. He praised the film for the lighter comedic touches, and described it as "big dumb fun" overall. His colleague Philip French of The Observer described the film as being in "A-Team territory" with the action sequences being well enough put together but that "it was all done far better in Walter Hill's Extreme Prejudice". Director Quentin Tarantino offered a positive reaction to the film, calling it "dumb fun". The film played in 2,936 theaters and earned $9,406,348 on its opening weekend at the box office at #4. The film went on to earn $23.5 million in the United States and more than $5 million internationally for a worldwide total of over $29 million. Added to this, it made over $8.2 million on DVD sales in the USA alone, giving it a minimum earning of $37.6 million. In the United States, the DVD was released on July 20, 2010. ^ "THE LOSERS | British Board of Film Classification". Bbfc.co.uk. Retrieved 2017-02-22. ^ a b "The Losers (2010)". Box Office Mojo. Retrieved 2010-08-14. ^ a b "The Losers". The Numbers. Retrieved 2010-05-20. ^ a b Horn, John (April 22, 2010). "Movie Projector: 'Dragon' will breathe fire again". Los Angeles Times. Tribune Company. Retrieved May 9, 2010. ^ a b Weintraub, Steve (March 25, 2010). "Jeffrey Dean Morgan On Set Interview THE LOSERS – Read or Listen". Collider. Retrieved May 13, 2012. ^ Ian Caddell (April 22, 2010). "Jeffrey Dean Morgan gambles on The Losers". Archived from the original on 2012-10-20. 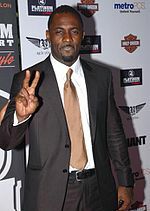 ^ "Idris Elba on The Losers". Den of Geek. November 1, 2009. Retrieved May 13, 2012. ^ a b Weintraub, Steve (March 25, 2010). "Zoe Saldana On Set Interview THE LOSERS – Read or Listen Here". Collider. Retrieved May 13, 2012. ^ a b Marshall, Rick (April 23, 2010). "Chris Evans Gets 'Nerdy' For 'The Losers' Role". MTV (Viacom). Retrieved May 13, 2012. ^ Weintraub, Steve (March 25, 2010). "Director Sylvain White On Set Interview THE LOSERS – Read or Listen Here". Collider. Retrieved May 13, 2012. ^ a b c d Rick Marshal (2010-03-24). "'The Losers' Director On Creator Collaboration, Scheduling, And His Favorite Scenes". MTV. Viacom. ^ Rick Marshall (2010-04-23). ""the Losers" director on where the movie and comics Connect, revealing the Villain, and potential sequels!". MTV Splashpage. Viacom. ^ a b c d e f Scrietta, Peter (April 8, 2010). "34 High Resolution Photos from The Losers". /Film. Retrieved May 13, 2012. ^ Peter Sciretta (2010-01-30). "New Promo Photo for The Losers Recreates Comic Con Teaser Poster". /Film. ^ Rocco Passafuime (April 22, 2010). "Jeffrey Dean Morgan interview for The Losers". The Cinema Source. p. 3. Retrieved 2011-02-14. ^ "The Losers". ComingSoon.net. Retrieved 2009-06-25. ^ Ian Mason (February 14, 2010). "'The Losers' release date put back". ^ The Losers Trailer (2010) on YouTube Retrieved 2010-05-20. ^ BrentJS (2010-02-17). "The Losers Release Date Moved (Again)". Retrieved 2011-10-22. No explanation was given for this second move, but it's likely that Warner is looking to avoid a box-office shootout with The A-Team, which opens on June 11th. ^ Ronnita Miller (February 16, 2010). "The Losers' release date moved again". ^ "The Losers (2010)". Rotten Tomatoes. Retrieved 27 March 2019. ^ "The Losers Reviews, Ratings, Credits". Metacritic. Retrieved 2010-06-03. ^ John Anderson (April 23, 2010). "Only Action Clichés Win in 'Losers'". The Wall Street Journal. Archived from the original on 2010-04-26. ^ Scott Tobias (April 22, 2010). "The Losers". The A.V. Club. The Onion. Archived from the original on 2010-04-24. ^ Kyle Smith (April 23, 2010). "'The Losers' is a no-win situation". New York Post. ^ Phelim O'Neill (May 27, 2010). "The Losers". The Guardian. London. ^ Philip French (May 30, 2010). "The Losers". The Observer. London. ^ "Quentin Tarantino and Harvey Weinstein Spotted". YouTube. 2010-04-28. Retrieved 2017-02-22. ^ "The Losers (2010) – Weekend Box Office Results". Box Office Mojo. Retrieved 2010-05-20. Wikimedia Commons has media related to The Losers (film).